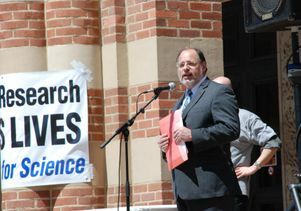 UCLA researchers who have been targeted by anti–animal research extremists were joined Thursday, April 8, by roughly 200 supporters, from UCLA colleagues and students to USC scientists and even a few family dogs. 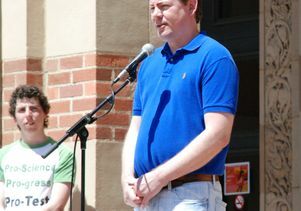 The "Stand up for Science" rally and march on UCLA's campus was organized by Pro-Test for Science, a grassroots organization of faculty, staff and students modeled after a group formed by Oxford University students in England. Organizers staged the rally with the goal defending the right of researchers to pursue their work free from harassment by extremists and to providing the public with a better understanding of animal research. Carrying neon poster-board signs bearing slogans like "Animal research = medical advances" and "Science, not violence," demonstrators rallied at the southern edge of UCLA before marching to the center of campus for speeches. Some passing students found themselves greeted by marching friends who cajoled them to follow along. "Join the fight!" one demonstrator called to a friend, who rushed to join the pack. Tom Holder, a co-founder of Pro-Test and founder of the group's British predecessor, jogged from head to tail of the procession, leading the crowd in chants of "No more threats, no more fear! Animal research wanted here!" The crowd gathered in Wilson Plaza to hear from Holder and Pro-Test co-founder J. David Jentsch, a UCLA professor of psychology and psychiatry, who helped form the group last year after extremists came to his home and firebombed his car in the middle of the night. "We're trying to defend and advocate for science itself," Jentsch said. "A small but vocal and violent minority of people have decided that they want to seek an end to animal research, including its contributions to medical research. If we continue what we're doing here today, people will understand what's at risk, and that effort will fail." Animal research is vital to uncovering treatments for brain disorders, from autism to schizophrenia, said Kevin Quinn, a branch chief from the National Institute of Mental Health. "Animal research conducted in a humane, ethical and responsible manner is absolutely critical … to understand, treat and cure mental disorders," he said. Families spend decades dealing with illnesses diagnosed in children — illnesses the NIMH believes can eventually be treated, Quinn added. "These disorders are brain disorders, probably the most complex structure in existence. We need animal research to tease apart the complex functioning of the brain so we can understand and treat these disorders," he said. Animal research does not produce medical breakthroughs every day, said Michael Steinmetz, a program director with the National Eye Institute. The foundations of those breakthroughs are discovered one building block at a time by basic research that must be supported, he said. "The National Eye Institute supports strongly the use of appropriate animal models in research, not just for the big clinical advances but for the many, many years of basic science that it takes to discover the underlying biological principles," Steinmetz said. "Along with the privilege of using animals comes a responsibility to see that the animals are used in a humane fashion … We should all take a very firm stand on that." Animal research at UCLA has improved and saved lives, noted UCLA Executive Vice Chancellor and Provost Scott Waugh. Pro-Test's ongoing efforts have bolstered support for and increased understanding about animal research, Waugh said. The past year has also seen progress in cracking down on extremists, he added. "A Los Angeles County grand jury indicted two people for stalking and other felony charges relating to harassment of UCLA researchers. Last month, two plea agreements were reached that included jail time and probation," Waugh said. "That sends a strong message that violence, threats and other criminal activity are never a viable alternative to dialogue." A petition circulated by Pro-Test denouncing violence against researchers garnered 11,600 signatures, Jentsch added. "I chose this profession because … I felt that I could make people's lives better because of my work," Jentsch said. "It's not over. Some of us still suffer regular, obscene demonstrations at our homes. Our children and our neighbors are squarely in the crosshairs of some of the extremists. They declaim us for being violent and sociopaths. Because of this we must redouble our efforts. That's what we're here for today." 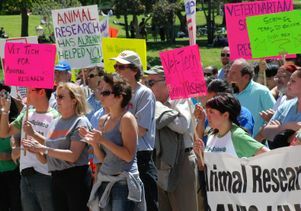 Jentsch spearheaded Pro-Test's first march a year ago when 700 supporters gathered to support researchers and counter a protest held on campus by anti–animal research activists at the same time. This year, Pro-Test preempted an activists' rally planned for April 22 by two weeks in order to teach people about scientific research beforehand. 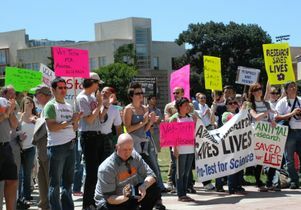 Supporters of animal research listen to speakers at the April 8, 2010, Pro-Test rally on the UCLA campus. 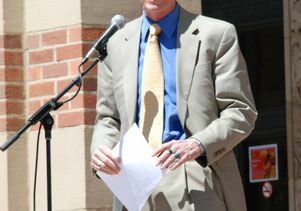 UCLA Executive Vice Chancellor and Provost Scott Waugh speaks at the April 8, 2010, Pro-Test rally on the UCLA campus. 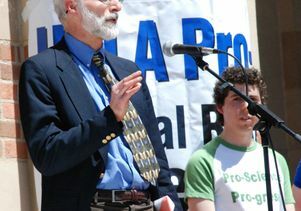 A crowd listens to speakers at the April 8, 2010, Pro-Test rally on the UCLA campus.